Restaurant Week | Nyc Fit Food Fashion! NYC Restaurant Week has come and gone. We were able to get out for three date nights during Restaurant Week. The last restaurant that we visited was Shula’s Steakhouse. I was surprised to see that Shula’s was a hotel restaurant inside of the Westin Hotel NYC. There is no where better to be for steaks than in New York City. The restaurant week menu at Shula’s had steak, chicken and fish as options but we obviously went there for steak. The atmosphere was a lot nicer than your average hotel restaurant. It has an old school NYC Steakhouse feel to it and was dimly lit making it romantic. There were some football photographs around Shula’s, if you did not know Shula’s is a chain of steakhouses owned by Hall of Fame Football Coach Don Shula. We were seated as soon as we had entered the restaurant and the hostess was friendly and welcoming. Our waiter was over in a few minutes and took our drink orders and brought us some warm bread with in a few minutes of us being there. I was a huge fan of their sour dough bread and who doesn’t love warm bread. We had two options for appetizers. I went with the Caesar Salad with sour dough croutons and Jon had the Sea Scallops with pineapple mango salsa. They were both really yummy. The portion on the scallops was small, Jon was served one scallop but it was delicious. My caesar salad was your standard caesar salad not the best I have had but I ate every bite, which means it could not be bad right? As I had mentioned previously there was three options for entrees but I could never go to a steakhouse and not order steak especially in New York City. We both ordered the New York Strip, with beranaise sauce, potatoes au gratin and green beans. Jon upgraded his steak size to the 16 oz but I was quite happy with 8 ozs of steak! When the steak came to the table they asked us to cut it in the middle and make sure that it was cooked to our liking before the waiter left. We both ordered medium rare and the steaks were cooked perfectly. Jon is not a cheesey potato fan so he did not enjoy the potatoes au gratin but I loved them and the green beans were just plain green beans. Not to much I can say about the green beans. 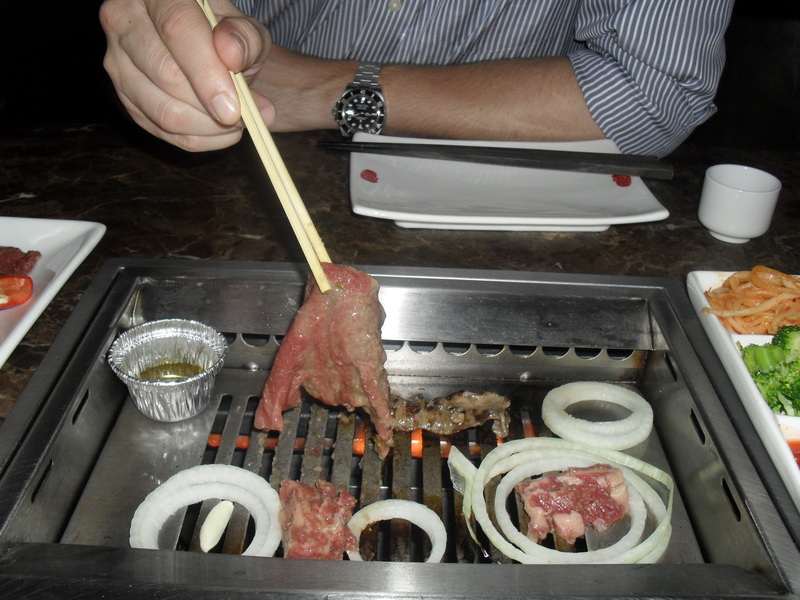 My steak though was amazingly seasoned and did not disappoint this meat lover. Being restaurant week there was obviously dessert. I was stuffed and Jon having eaten all 16 oz of steak was beyond full but we ate dessert anyways! Jon ordered the cheesecake and I had the carrot cake. I had a bite of the cheesecake and was incredible but when is cheesecake bad? My carrot cake was sooooo good and it was in a rum sauce that was a sumptuous addition to the carrot cake. It had a melted vanilla ice cream kind of quality to it and I loved it! This being one of our last date night’s before the baby come, I am happy that we spent it at Shula’s. Right now we have 2 weekends left till baby. That means I have 2 weekends to get out there and have some romantic adult time with my husband before we are prisoners in our NYC 1 bedroom apartment! If you are thinking about visiting Shula’s Steakhouse I would totally recommend it and would return. The service and the food were both top-notch in my books! Now where are we going to go this weekend?? NYC Restaurant week is here and it is going on till March 7th. Since it is Restaurant Week and I am due in a month we decided to take advantage and reserve a few date nights. Our first NYC Restaurant Week date night outing was to Aureole-Bar Room. 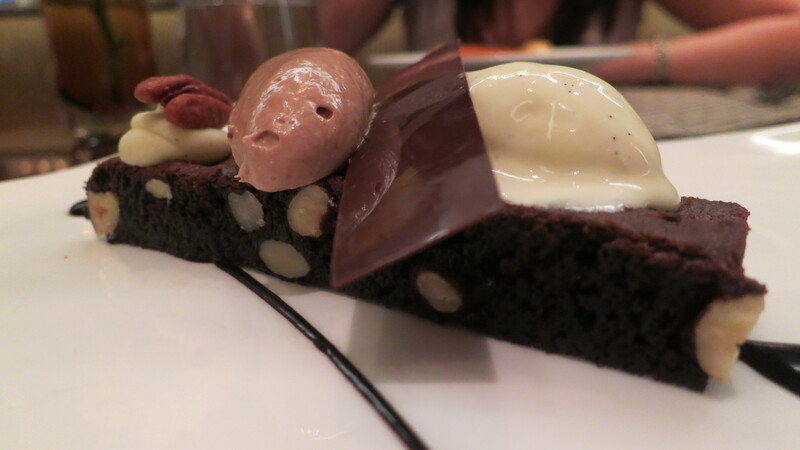 We have visited Aureole in the past for Valentine’s Day so we already knew that the food there is amazing. We arrived for our reservation and we were seated right away. The service was friendly and they were quick to bring us out waters. They did not have any virgin cocktails on the menu. Jon asked about it for me and the bartender whipped me up a little something. I still do not know what it was but it was delicious! We were brought some really yummy bread. I know bread is bread but this stuff was good so it is worth mentioning. For restaurant week they have a prix fixe menu with a few choices for appetizer, entrees and a dessert all for $38.00 per person. I chose the Cavatelli Pasta Amatriciana, the pasta was delicious and cooked al dente just the way I like it. Jon had the Fluke Tartare and it was soooo yummy. I have to admit I did have a few bites of it! WOW is what I have to say about the entrees. 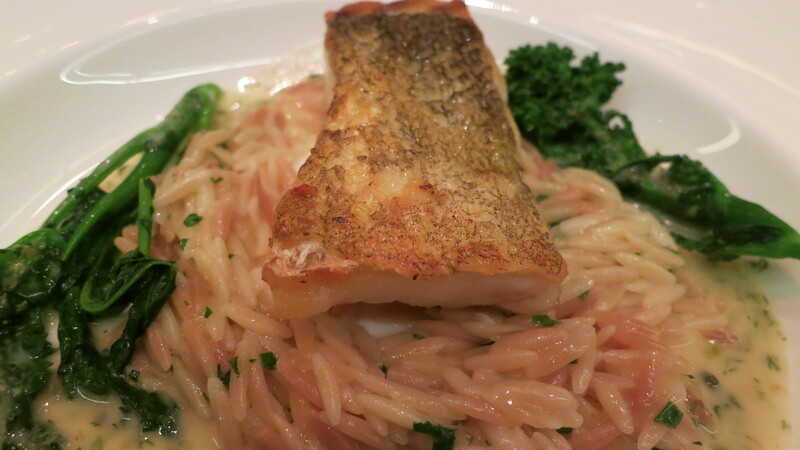 I had the Chatham Cod with orzo, broccoli rabe with a lemon beurre blanc. If I could eat this fish all of the time I would. The crispy skin on the cod was incredible. I wish I could have had 2 servings it was so amazing! 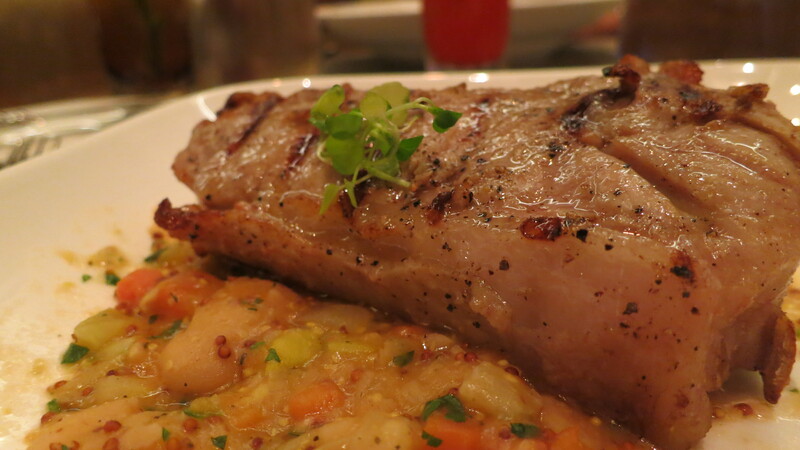 Jon had the Grilled Veal Chop with gigante white beans, leeks, English mustard jus. The veal was good but if you do go during Restaurant Week I can not say enough that you must have the Chatham Cod. Honestly it was one of the best fish entrees that I have ever taken a bite of! At this point I was already pretty full but we still had dessert to get through and I am glad I had it. For dessert I got the Dulcey Pannacotta and Jon ordered the Warm Chocolate Brownie. They were both so decadent and well worth the extra calories. You can not go wrong with either. It is really a question of how much of a chocolate fan are you. Jon is more of a chocolate person than I am so he was drawn to the brownie right away. 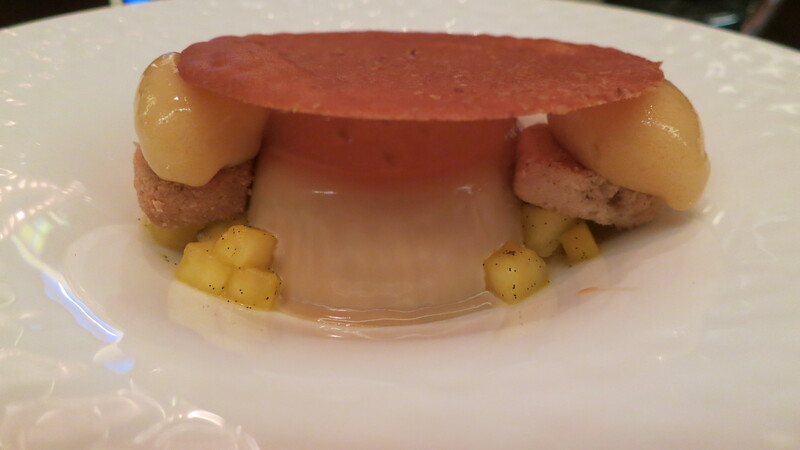 I was happy with my choice the Pannacotta is out of this world yummy. Once again Aureole out did themselves. The service was great except at the tail end when we had to wait awhile for dessert. Other than that it all came out really quick. If you are in NYC during Restaurant Week or anytime this is a restaurant that you can not miss. We will definitely return again especially for the Cod. I cannot stop thinking about it! 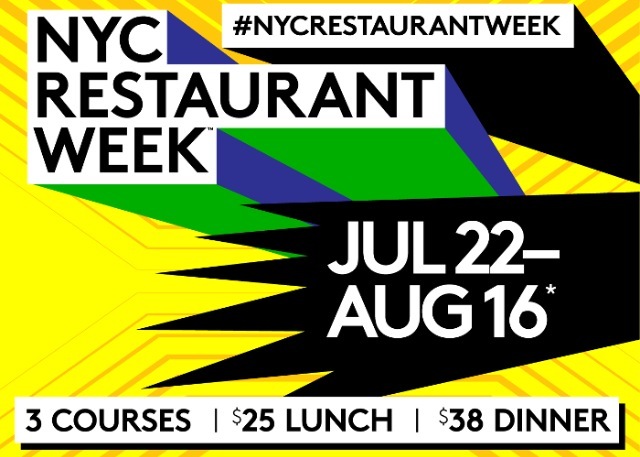 Now that New York Fashion Week is over it is time for NYC Restaurant Week. I love restaurant week! It comes twice a year and fully enough it is on longer than a week. It is more like 3 weeks. but who would complain about that right? We have been trying to save money for the baby by going out less. This Restaurant Week could not have come at a better time. We get a deal and we get to go out a few more times before the baby comes at the end of March. If you want to make reservation for NYC Restaurant Week I suggest making them ASAP. The really good places tend to fill up fast. I have been able to score 3 reservations so far. My choices this year will be Auerole Bar Room, City Lobster and Shula’s Steakhouse. We actually have been to Auerole before, for Valentine’s Day 4 years ago and it was absolutely amazing. Some of the best food I have ever had. I am really looking forward to returning. I will also be writing reviews to share with all of you guys! Restaurant week is one of my favorite events in the city. The best part is that it is longer than a week! The second best part are the prices! Every Summer and Winter Restaurant Week returns, with over 300 restaurants to choose from. This event definitely causes me to eat out a lot more than I normally would. At these prices, it is affordable for a lot of New Yorkers to try out some of the best restaurants in the city. 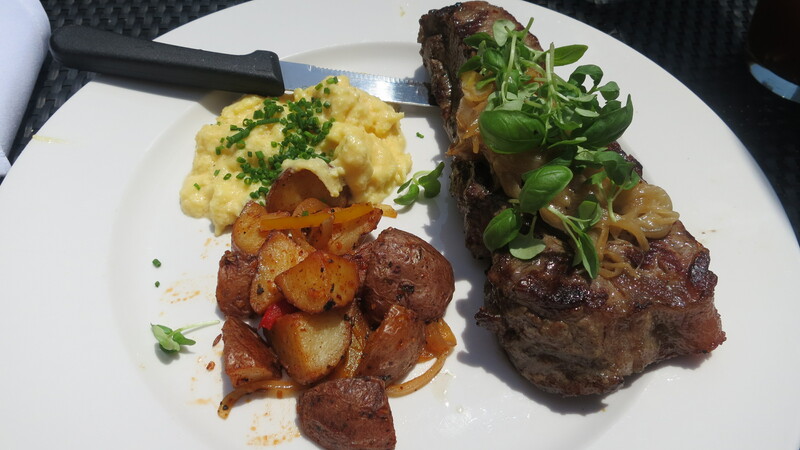 Three- course meals, lunch priced at $24.07 and dinner at $35.00. Reservations and a full list of venues participating in Restaurant Week NYC are available at nycgo.com/restaurantweek. Bookings open up July 8th, get reservations at the best spots right away!! Includes 1 Whole Maine Lobster, steamed little neck clams, baked red russet potatoes, farm fresh corn on cob. Deliciously prepared by Chef Seth Levine. $25 BEER BUCKET & COCKTAIL SPECIALS. Here is the link: http://hclobsterbake-es2.eventbrite.com/?rank=24 I am going to be checking this one out for sure! NYC Restaurant Week has arrived! Edible Manhattan and Wichcraft. Wednesday June 26th, 2013. 6:00pm to 9:00pm.